I am pleased to announce that I am among the competition winners in this month’s issue of New American Paintings #127, Pacific Coast Competition, juried by Jarrett Gregory, Associate Curator, Contemporary Art at LACMA. This will be my second appearance in the publication. My work was also included in Issue #73 juried by Alma Ruiz, Curator, The Museum of Contemporary Art Los Angeles. The current issue features two paintings from my recent Audience series and a heavy hitter from 2013. 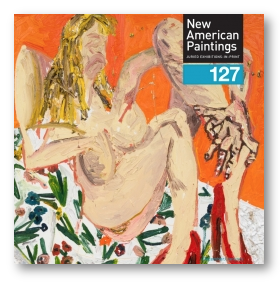 New American Paintings is offering a collectors, friends and families discount on the magazine. Click here and enter the coupon code 127PC at checkout to order the edition for only $15, shipping included (normally $20).